Had a damp walk up Myrtle Gully then back down the Old Farm Trail. Not a lengthy walk, but it took a while with plenty of fungi to photograph, and mostly in difficult positions requiring tricky camera placement. The weather forecast said it would be fine. It wasn't. A later wander at Collinsvale up the Myrtle Forest Track was even wetter, precluding the use of the camera entirely. 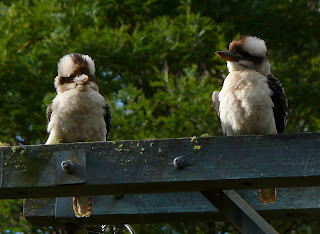 The Kookaburras were sitting on the electricity pole at the top of Old Farm Road.